There’s no place like home, and Absolute Homecare and Medical Staffing helps seniors remain safely in the comfort of home and provides support to the family and friends who love them. We are here to address your concerns and to provide the non-medical services you need, whether it’s a helping hand with chores, help with errands or transportation to a doctor’s appointment, companionship, assistance with personal care or a reminder to take medications. It can be a difficult decision to make when you or a loved one is in need of at-home care services. 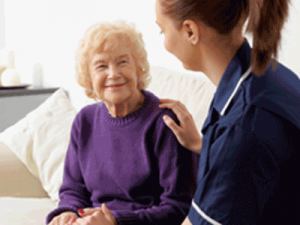 The task of finding an appropriate home health care agency can be daunting. You want to choose one that will treat your loved one with genuine compassion and respect and view their needs as the number one priority. Absolute Home Care and Medical Staffing is the solution for you and your family. Founded in 2005, Absolute Home Care is a locally owned agency which is a leading provider of quality home health care services in the Southwest Michigan area. We provide quality caregivers that deliver family and client-centered care that allows people to stay in the comfort of their own home. Absolute Home Care and Medical Staffing understands and we are sensitive to the needs of both the client and their family. We know that this can be a very important time in an older adult’s life, one that needs to be treated with care so that they may live a strong and healthy life. We are committed to delivering the best care possible so that your loved one can maintain or achieve the highest level of self-sufficiency. Contact us today to schedule a free in-home assessment: 269.324.8080.